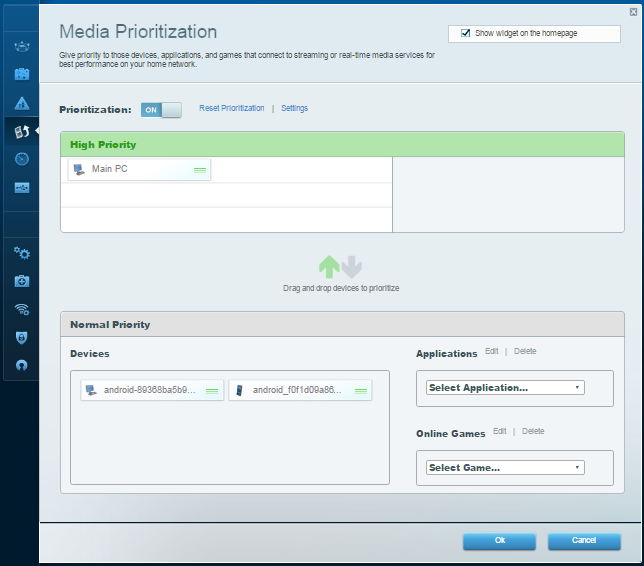 Media Prioritization lets you decide which devices or applications get network bandwidth priority. The Settings tab of the Media Prioritization Tool allows you to configure more settings related to this function. This article will give you an overview of the Linksys Smart Wi-Fi Router's Media Prioritization settings. NOTE: To learn how to use the Media Prioritization Tool of the Linksys Smart Wi-Fi Router, click here. For video instructions on how the Media Prioritization Tool works, click here. 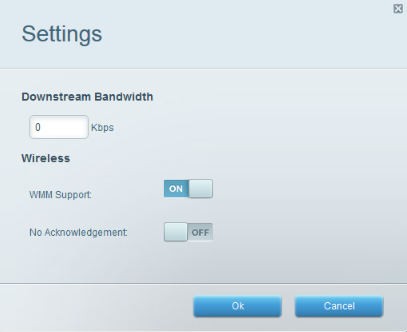 Downstream Bandwidth - This feature gives you the option to specify the downstream bandwidth speed to use in kilobits per seconds (Kbps). A value of 0 is unlimited. If you set it too high, the router can’t apply the priorities correctly and problems may occur. WMM Support - This is enabled by default and it improves the quality for audio, video and voice applications by prioritizing wireless traffic. NOTE: The Wi-Fi Multimedia (WMM) Support feature can be configured under Media Prioritization for Linksys Smart Wi-Fi Routers or from Applications & Gaming > QoS in Linksys Wi-Fi Routers. No Acknowledgement - This option allows you to specify whether the router re-sends data if an error occurs. This is disabled by default. You also have the option to reset the prioritization list to clear any settings you've made. To learn how to reset the Media Prioritization, click here. Aside from these Media Prioritization settings, you can also choose applications or online games which you want to have higher bandwidth priority. To know more on how to add new applications or online games, click here.